I've only got one new ebay piece this week. 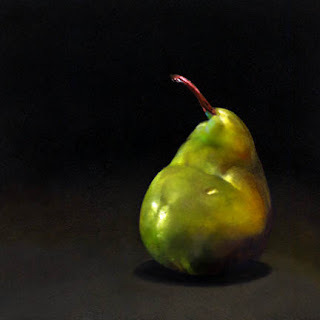 I'm working on a pear painting for the galleries, and I wanted to do a study of that particular pear for auction. The gallery piece won't have a cherry, but I thought the two went nicely together. 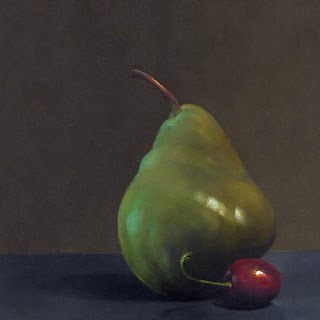 The overall mood of the larger painting will be the same as this smaller version, and that was my intention. To attempt a more muted atmosphere than I usually portray. I think it works. If you're interested in bidding on this painting you can do so by clicking here. I'm working on some new gallery paintings at the moment, but nothing is complete as yet. So, I thought it would be a good time to plug my friends again. 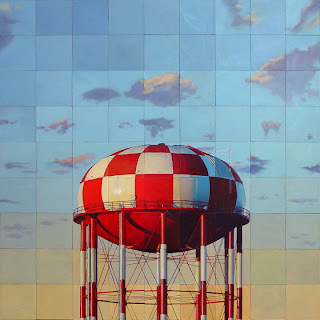 Jeff Cohen has been working on these "fragmented" water towers for about a year now, and they have proven to be extremely popular. The painting above, entitled Like Candy, is one of his most recent towers, and my favorite to date. It looks good here, but to see it in person is a religious experience. That piece was at Stricoff in New York, and sold immediately. Jeff has other water towers available at Stricoff, as well as at Twinhouse in Atlanta. 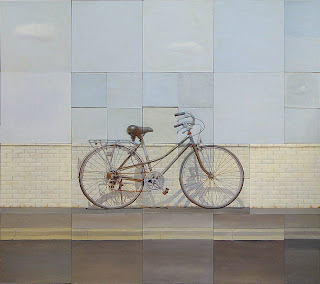 He has also had great success with his bicycles like the one above, entitled 110 Degrees, and his still lifes. All done in this fragmented style. 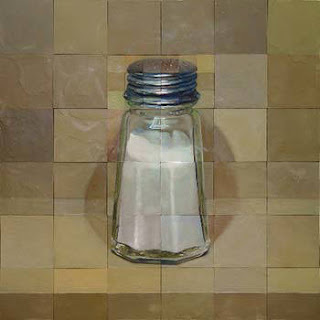 His large salt shakers, like the one below, entitled Big Salt, are my favorites. It's extremely invigorating, and intimidating to visit Jeff, and walk amongst these paintings before they are shipped off. I'm inspired, and simultaneously deflated by his talent. The phrase, "I'm not worthy" creeps into my mind. In truth it makes me work harder. Karen and I love to visit Jeff, and his wife Leslie (also an artist - I'll post some of her work later) and talk art. It really gets the creative juices flowing. You can see these paintings, plus Jeffs' "Magic Pictures" on his website, which you can access by clicking here. Here is number four of this weeks ebay listings. Continuing the red theme. Tonight, it's a bowl of cherries. 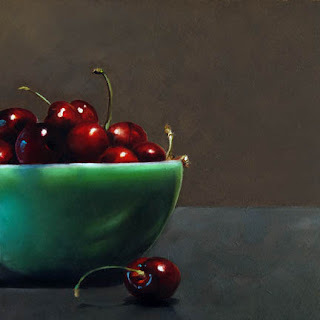 I've been wanting to work this small Jadeite bowl into some paintings, and I thought it would look good with cherries. If you're interested in bidding on this painting you can do so by clicking here. This is number three of this weeks ebay listings. Continuing a red week. Tonight, it's the vintage drinking glasses. 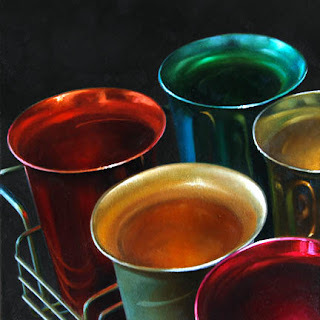 We've had this set of aluminium glasses for a long time, and I've often thought of using them as a subject for a painting. Finally got around to it, an it was really fun. I've got a number of other compositions ready to go. Most of them composed in a larger format intended for the galleries. If you're interested in bidding on this painting you can do so by clicking here. This is number two of this weeks ebay listings. It's going to be a red week. Tonight, it's a little tomato. 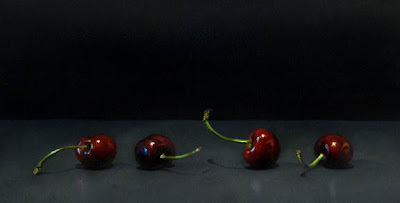 The next three days will have a couple of cherries, and what I'm hoping will be a pretty cool painting of some vintage aluminium drinking glasses. The predominant glass will be . . . red. If you're interested in bidding on this painting you can do so by clicking here. Starting off this second week of ebay paintings with some salad dressing. We just got these two bottles for dispensing our olive oil, and balsamic vinegar. 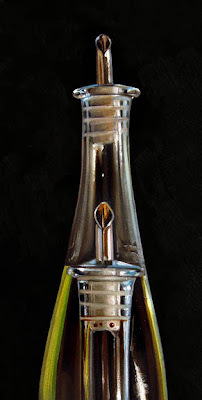 I knew right away I'd be doing at least a couple of paintings of these bottles. I've already got a number of other compositions ready to go that I really like. If you're interested in bidding on this painting you can do so by clicking here. Finishing off the week with a hint of red. Cherries are back in season, and this is the first of a new batch of compositions. No bowls, no linen, just the fruit on a stone table top. If you're interested in bidding on this painting you can do so by clicking here. This is number four of this weeks ebay listings. It seems to be a week of single objects. 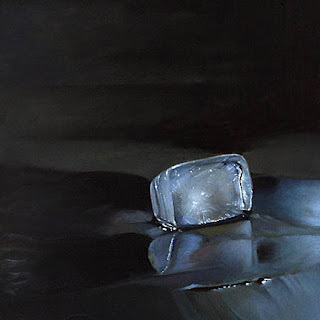 I've got a few compositions involving ice in the works, so this is a study, of sorts, of ice. Suffice it to say you may see this particular cube again in the future - if one of those compositions gets the go. If you're interested in bidding on this painting you can do so by clicking here. I'm back to the little glass sphere. 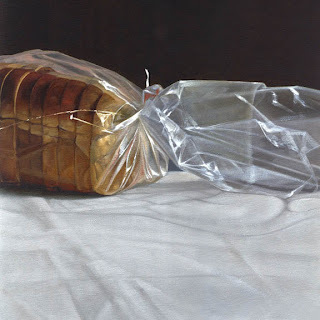 I never seem to tire of painting this subject. It was lit from above in this composition. 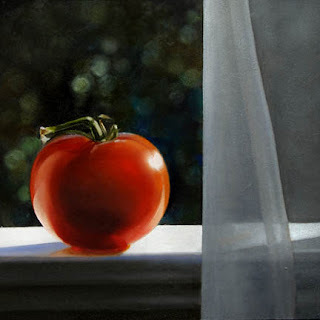 I wanted to see, with more direct lighting, if I could draw out the depth of the object. 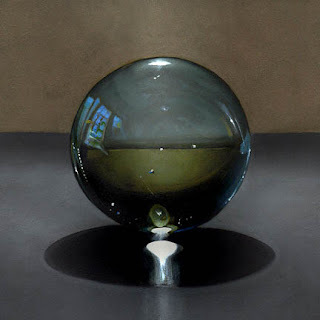 Portray a sense of the "glass". I've just begun a search for an actual crystal ball. One with less impurites, and more refractive capabilities than these particular glass spheres. 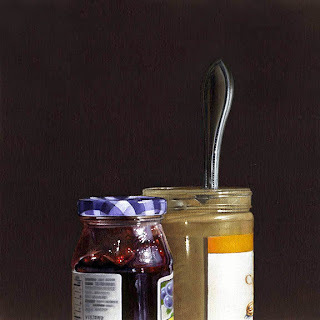 Utilize it in a manner similar to, but not a direct "rip-off" of, artist Steve Mills. If you're interested in bidding on this painting you can do so by clicking here. I found four of these small goblets at one of our local antique shops. They had a really great shape, and three of the four shined up nicely. 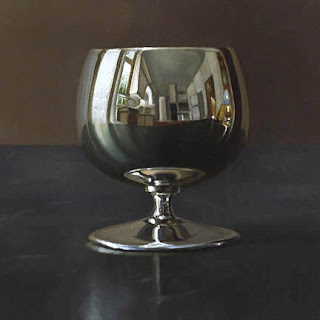 They've rekindled my enthusiasm for painting reflective objects, and will probably be seen frequently on this site for a while. If you're interested in bidding on this painting you can do so by clicking here. I'm back on ebay this week. This is the first of five new six by sixers'. A single pear on a soapstone table top, lit from above by incandescent light. I had a good week, and was pretty happy with all of my new pieces. If you're interested in this one, you may bid on it by clicking here. Here is another for the upcoming group I'll be sending to Twinhouse. Love the bread. These will be delivered to the gallery in the next couple of days. Early next week I'll be posting some new six by sixer's for ebay. If you're interested in the purchase of this piece, you can contact Tiffany at Twinhouse Gallery by clicking here. Here is another for the upcoming group I'll be sending to Twinhouse. Something for the peanut butter and jelly to go on. These will be delivered together when the group is complete. If you're interested in the purchase of this piece, you can contact Tiffany at Twinhouse Gallery by clicking here. Here is another of the upcoming group I'll be sending to Twinhouse. PB&J No. 4. 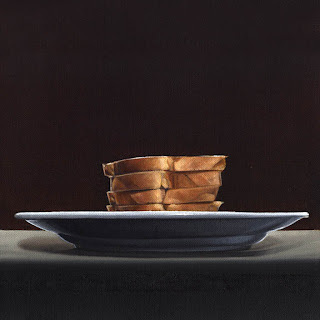 I first became aware of this subject through the work of artist Duane Keiser. I discovered his peanut butter paintings listed on ebay by chance, and was inspired to pursue this theme myself. It's a subject I enjoy, and plan to visit often in the future. I'm going to wait, and deliver these paintings together when the group is complete. If you're interested in the purchase of this piece, you can contact Tiffany at Twinhouse Gallery by clicking here.